Android devices come from all walks of life, but in each generation there is a "chosen one". In 2012, it's the Nexus 4 and, as an overall package, this is probably the best Google has ever delivered. Yet, by a mean twist of fate, it has the most formidable opposition of any Nexus phone so far. Even with Google's official backing, the purebred Nexus 4 is not guaranteed a win against the Samsung Galaxy S III - the Android smartphone of the season, which has been selling in numbers that make Black Friday look like a slow day at the grocery. The hook of the Nexus 4 is flagship specs at a hard-to-beat price. It has a top-notch screen and chipset, but some corners had to be cut to make the budget (the non-expandable inbuilt memory is particularly painful). 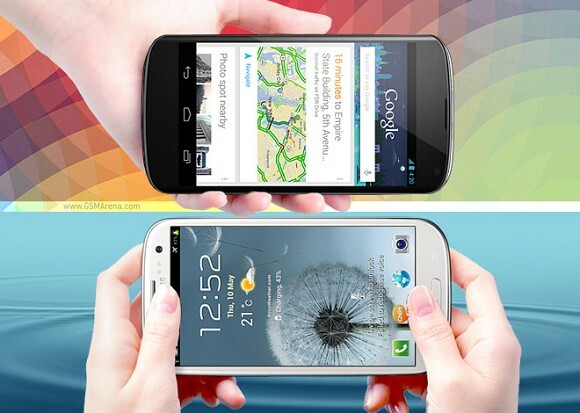 There's a clear objective but dethroning the Galaxy S III is a huge challenge. That beast of a droid has set the user experience bar quite high. Of course Samsung just cannot match Google's aggressive pricing, but the 5-month market advantage has made the Galaxy S III a little more affordable. The flip side of the coin is that the Galaxy S III hardware is no longer cream of the crop. The Nexus 4 on the other hand, has availability issues - it runs out in minutes. Another thing is that it costs $350 only in countries where the Play Store is available too, elsewhere it gets quite steep. Let's follow proper championship protocol and go over the highlights of each contender while they wait for the bell in their corners . The Nexus 4 is using tech that will only go into full swing next year. The Galaxy S III in turn will inevitably start showing its age. Our experience with the two phones though is that the Samsung flagship is not to be easily dismissed. The software is a different story - Google's approach is one of purist simplicity, while Samsung throws everything its R&D department has cooking up in the labs (and those guys are pretty prolific). They say the whole is greater than the sum of its parts, but before we get to the actual experience with the Google Nexus 4 and the Samsung Galaxy S III, we do have to look at their bits and parts first. The hardware checkup is first on our list. Yes i have nexus 4. now, it's android 5.0. So the purest form of android came on top again. Hard luck for plastic fans. Still we on the same boat, just class being apart, where Nexus getting lollipop and galaxy enjoying a break back at economy class both flying android international airlines.